This program raises awareness about the water crisis among Israel’s youth, promote conservation, and help students develop skills to address environmental challenges. The JNF Parsons Water Fund supports educational programs to raise awareness about the water crisis among Israel’s youth, promote conservation, and help students develop skills to address environmental challenges. These efforts will foster a new generation of responsible citizens and will result in an estimated savings of more than 10 billion gallons of water. One important project is the Rainwater Harvesting Program, developed by Israeli schoolteacher Amir Yechieli, which serves a dual purpose of conservation and education. Tanks are installed on school grounds to collect rainwater that would otherwise be wasted. Then the water is pumped back into the school to be used to flush toilets and water the land around the school, reducing each school’s reliance on other sources of water by 77%. Students are involved in the planning and management of the system and participate in a dynamic educational curriculum that teaches them about the water crisis and the need for conservation. The money saved on water-related expenses is earmarked for continued funding, making the program self-sustaining. 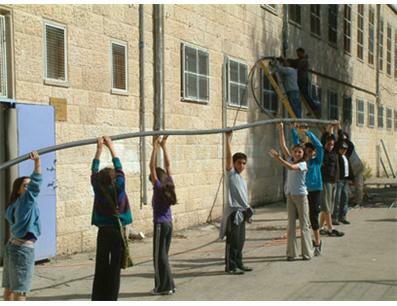 Over 80 schools currently participate; the goal is to implement the program in as many schools as possible throughout Israel. The total cost to introduce the program in an individual school is $50,000 for a five year period including constructing the system and providing school-wide education programs. Israel is facing its most severe water shortage in nearly a century. Seven consecutive years of drought have deprived its natural water sources of sufficient replenishment, while a growing population and rising standard of living have led to a sharp increase in consumption. There is 75% less water available today than just 20 years ago, but an additional two million people to share the diminishing supply. Jewish National Fund is uniquely dedicated 100% for Israel and no other organization consisting of Jews of every affiliation and others is committed to caring for the land and people of Israel as we are. Israel is facing its most severe water shortage in nearly a century. There is 75% less water available today than just 20 years ago, but an additional two million people to share the diminishing supply.